Carbons and residues expelled from the roots of live plants provide sources of energy and nutrients for the organisms, which decompose organic matter, improve nutrient availability and soil structure, transmit and prevent disease and degrade pollutants. Soil organisms can increase or reduce agricultural production, likewise agricultural practices can be both beneficial and detrimental to the soil organisms. As with mineral uptake a natural balance exists. Access to carbon, a core element of organic matter and vital energy source for soil organisms and plants, is gained through decomposition. The population of micro-organisms is the main engine for organic matter decomposition and nutrient release. 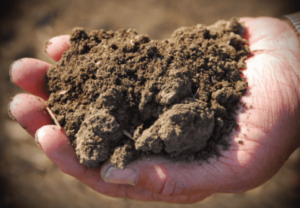 Soils with high levels of organic matter support a greater number and more diverse range of microorganisms whose activity within the soil makes nutrients available for each new generation of plants. Organic matter thus supplies the “life of the Soil”. Mineralization, the conversion of organic matter by soil organisms to available nutrients, is the key to soil fertility. While decomposing organic matter to obtain carbon, microorganisms release other nutrients into the soil and air. These may be: soluble and leached (e.g. nitrate [NO3]), volatile and lost to the atmosphere (e.g. nitrogen as N2 & N2O, sulfur as H2S) or readily available to the plant (e.g. nitrates, phosphates and sulfates). In order to increase the up-take of a specific nutrient, many plants form mutual relationships (symbioses) with soil micro-organisms. Examples of symbiotic relationships include: legumes with the bacteria Rhizobium sp. to fix atmospheric nitrogen gas, and Mycorrhizal fungi with most plants to absorb water, nitrogen, phosphorus and other nutrients from the soil. 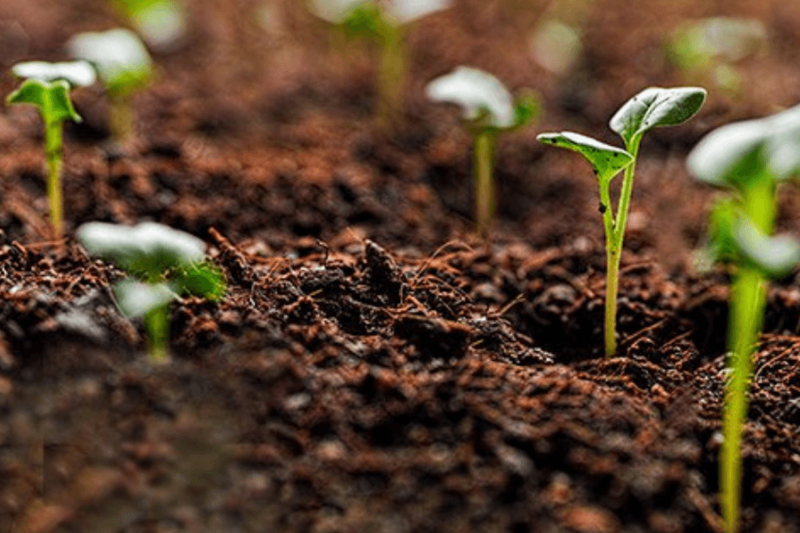 Microbial activity is the natural life cycle of the soil system, in which nutrients become available to plants. Therefore, a soil with no microorganisms can be considered a dead soil. Soil organisms act as bio-filters by degrading soil pollutants. Many agrochemicals are broken down by soil microorganisms however their effectiveness will be modified by the soil environment. Toxic elements, e.g. arsenic, chromium and mercury, can be ‘locked’ in the soil by microbial activity, preventing further pollution. Disease causing organisms (pathogens) affect crop and plant growth in two ways: by invading the plant cells, or by the production of poisonous metabolites and excretory products. By invading the root, to obtain nutrients, pathogens disrupt the root performance or reduce root length, breaking down tissue by rotting. 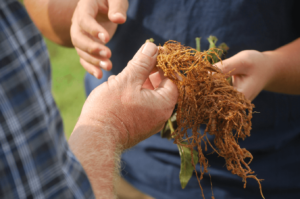 The degree of root damage generally relates to the number and type of pathogens present which in turn will be directly related to the presence or absence of a well balanced microbial diversity. Twenty to thirty-five per cent of all carbon energy or exudates (simple sugars, produced by photosynthesis) are pushed out of the roots into the soil to attract bacteria and fungi that will protect the plants from pathogens. This is a natural condition which can be disrupted by excessive chemical applications, often resulting in pathogenic species becoming dominant. Soils with high levels of organic matter and organism activity, or a specific group of antagonistic microorganisms, seem to prevent more aggressive pathogens from taking hold. These soils are termed suppressive soils. The idea of using one microorganism against another, the predator against the prey, offers an environmentally compatible and intellectually appealing approach for the control of plant diseases (Erwin and Ribeiro 1996). The success of biocontrol however largely depends on the type of antagonist as well as the basic knowledge about the selected antagonist(s) (Kunoh 2002). Trichoderma, Bacillus and Pseudomonas spp. have often been cited as having potential to controlling soil borne plant diseases and to increase crop yields (Cook and Baker 1983; Papavizas 1985; Backman et al. 1994; Chen et al. 1999). Mycorrhizal fungi, arguably the most widely studied and understood of all microbial species, act symbiotically with plants, positively affecting nutrient uptake, plant growth, disease control, water holding capacity, and the production of glomalin; the earths storehouse of soil carbon. Further Catska (1994) reported suppression of phytotoxic micromyceles and resultant replant symptoms by Mycorhizal fungi. Having an understanding of these fundamental soil properties, the addition of beneficial microorganisms work with you, improving crop profitability, whilst enhancing soils for future generations through the substances they secrete. Roots Shoots & Fruits Ltd.